Famed Bigfoot investigator Matt Moneymaker and his team of Bigfoot Field Research Organization (BFRO) experts travel to the forests of northern Georgia to examine footage of what could be a Bigfoot running across the road. 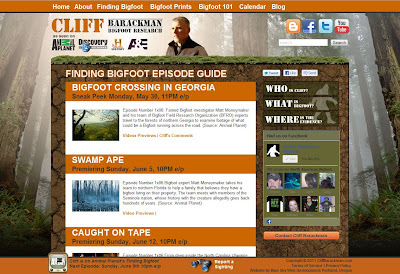 Below are three video clips from the the Finding Bigfoot Georgia Episode that can also be found on the Cliff Barackman website. The first Cliff Barackman Commentary regarding the Georgia Episode is already up. 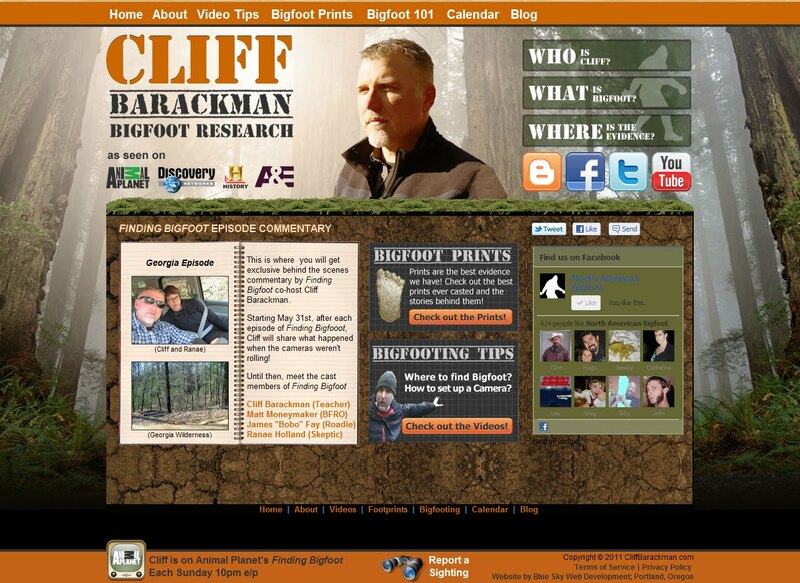 Rolling out in time for the premier of the TV show, Animal Planet's Finding Bigfoot, Cliff Barackman has a new website that he will update after each episode. He will share behind the scenes anecdotes and reveal what was left on the cutting room floor. From what we can tell this will be the best website to tune into after the show. The day after each episode airs, Cliff promises to give us "backstage" access to the show and cast members. The site stands very well on its own as well. 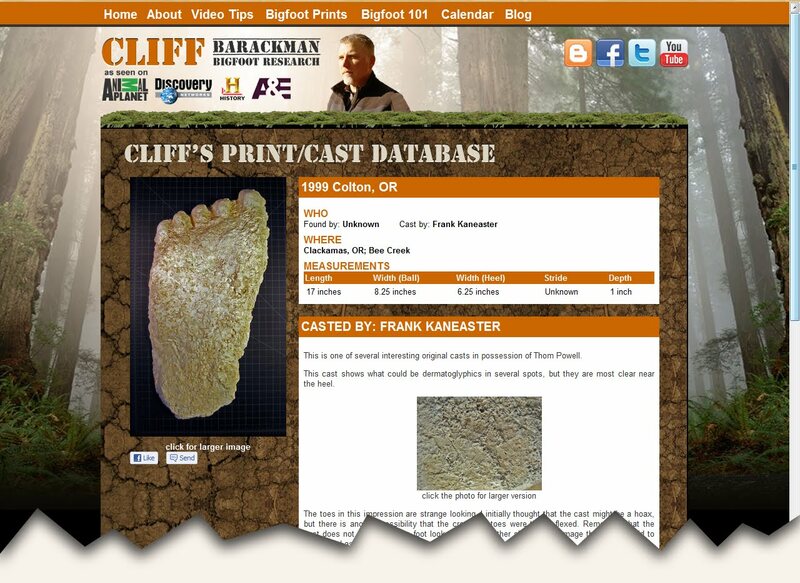 One of the other things we like is the updated Bigfoot Prints/Casting database. Most of the casts will be from Cliff's private collection. This part of the website, Cliff assures us will continue to grow. There are even a few castings from the Finding Bigfoot that will make it to site. There are a few other gems on the site that we think are nice, including a way for Cliff to collect Bigfoot sightings and encounters. As long as there some form of compelling evidence Cliff will investigate each submission. 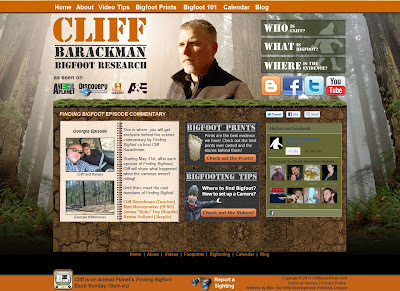 Check out the Finding Bigfoot Cliff Barackman website, and let us know what you think. Looks like Animal Planet and the rest of the folks at the Discovery Networks are serious about their new series Finding Bigfoot. If you have been following our Finding Bigfoot Posts, you know the series is about The four-person team goes to locations of alleged Sasquatch sightings to investigate with reconstructions and the latest technology to determine whether they were real or not. The team is made up of a former roadie, the BFRO president, a skeptical scientist, and a science teacher. The Team (left to right): James "Bobo" Fay (the Roadie), Matt Moneymaker (BFRO President), Ranae Holland (skeptical scientist), Cliff Barackman (a Science Teacher). The official series begins on June 5th, but they are providing a special preview a week early and they are running it right after River Monsters, Animal Planets biggest ratings hit. This bodes well for Finding Bigfoot and shows a vote of confidence that Animal Planet thinks they have a hit! Theres a YouTube video out that has the 30-second spot for the Special Preview Episode below. "I would like it (Bigfoot) to be real -- Dr. Eugenie Scott"
This is our third post regarding Bigfoot skeptics. 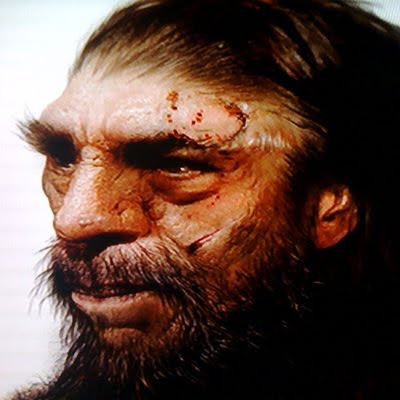 Previously we had a post about Brian Dunning, who although skeptical, is quite sympathetic towards us Bigfooters, and we also had a post on Benjamin Radford's top ten reasons Bigfoot is Bogus. It's important to us at Bigfoot Lunch Club to air all voices regarding Bigfoot, even if we disagree with them. We love intelligent Bigfoot skeptics, we really do. The really smart ones showcase what we, as Bigfooters, have to overcome. If they are really good, they do half of our work for us by defining challenges we may have overlooked. The good ones are worth listening to; enter Dr. Eugenie Scott. We educate the press and public about the scientific, educational, and legal aspects of the creation and evolution controversy, and supply needed information and advice to defend good science education at local, state, and national levels. Dr. Scott is also President of the Bay Area Skeptics. Founded in 1982, the Bay Area Skeptics encourages critical thinking and accuracy in the media and in our schools. They encourage rational thought and critical thinking through the use of scientific methods. They are particularly interested in such topics as claims of the paranormal, pseudoscience, and untested or poorly tested medical and psychotherapeutic practices. 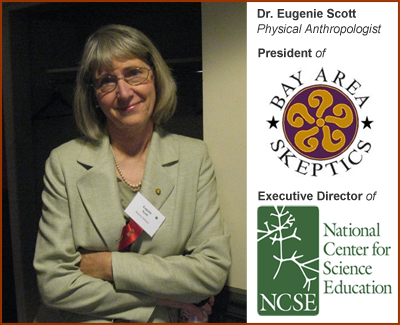 In the video below Dr. Eugenie Scott represents the Bay Area Skeptics. She quickly identifies two camps of Bigfooters. In the first camp, as she describes them, are the paranormal, mystical Bigfooters that believe Bigfoot can shape shift, she quickly marginalizes them and says that is an argument for theologists. In the second camp are, as she defines them, cryptozoologist. She is critical of their lack of scientific process and ability to test their explanations. On this point we agree, we wish there was better evidence to test our explanations, its not for lack of trying. Dr. Scott does say Scientist like Dr. Jeff Meldrum are heading in the right direction. Don't forget to see the entire program click on ""Watch Full Program" in the bottom right of the embedded video. We just have a small excerpt below from the full article at Australia's Daily Examiner. According to Yowie Researcher Paul Cropper, "In our book we recorded around 350 reports going back to the late 1700s, early 1800s, but I imagine there's a lot more than that which don't ever reach the media..."
After the excerpt you can check out Yowie and many other Bigfoot Variants at the official AKA Bigfoot World Map. ...“I reached the top of the hill and I was coming around the sweeping corner to the right when I noticed something a lot larger than a kangaroo in the middle of the road – my headlights weren't on it yet but it was a bright night and I saw what looked like a large person stooped over, with a big overcoat on,” Dean said. In our opinion blurry videos of Bigfoot does not make news--until it makes news. The Alaskan Dispatch files this story about a video posted on May 13th filmed in Ketchikan, Alaska. The full Alaska Dispatch report is below. 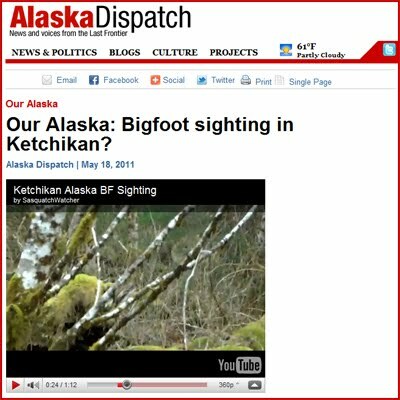 Our Alaska: Bigfoot sighting in Ketchikan? Driving up the Alcan Highway through Canada, there is a whole stretch of Canadian towns along the road touting their bigfoot-rich properties, a tourist draw for those who believe in the unsubsantiated animal. Alaska is well-known for its hulking wildlife -- bears, moose, caribou and sea lions are among the biggest draws -- but when it comes to the elusive bigfoot, there seems to be a dearth of sightings for a state so enveloped in the woods that play home to the legendary beast in other parts of the world. Maybe the Bigfoot's northern cousin, the yeti, is a more appropriate fit for Alaska, where half the state hangs above the Arctic Circle. But recently, YouTube user putua76 posted a shaky video that purports to capture the unconfirmed creature on tape near Ketchikan, Alaska. I was on a logging road in Ketchikan hiking with my friend when I saw it! Boy did my heart start racing!! It was about 40 yards from the road! Not sure if it knew I was there or not, because the noise of flowing water from the stream. It seemed to travel fast! It made my hair stand up!! At one point you can see a whitish yellowish thing in it's hand! I believe it was skunk cabbage. Not sure, but it is in bloom. You see it jump and after that point it just seems to disappear. There was a lot of brush and trees between it and I, I could not tell where it had gone. It was a scary sort of exciting feeling at the same time!! We went to search for tracks but the river bed where we thought it was walking was full of perfect skiping rocks, we found no prints! If there is a BigFoot, Sasquatch, or Kushtaka I swear I saw him!! According to the Bigfoot Field Researchers Organization, this would be the first reported sighting of a bigfoot in Ketchikan, although there have been 21 previous sightings in Alaska, eight of which have occurred in Fairbanks or Southeast Fairbanks. As with all bigfoot video the creature is hard to see, hidden behind trees and partially or totally obscured, giving just enough evidence for the skeptics to dispute and just enough for the believers to support. So is there a bigfoot in Alaska? We'll leave that up to you. Alaskan Dispatch: Bigfoot sighting in Ketchikan? Oooweee! The twitterverse has been lit up with reports of a new commercial for a TV show titled Finding Bigfoot. For those of you who do not know, Finding Bigfoot is an effort to end the 100-year old search for the mythical creature, Animal Planet is joining forces with Bigfoot researchers on a new series Finding Bigfoot. You can catch up with our Finding Bigfoot coverage. Starting as early as last Sunday, we saw tweets about the new promo. With diligence we set our channel to Animal Planet and waited---and waited. This task was not so tough, because we come from the age before iPods and MP3's. Back in the day (1983), if you wanted to get a recording of your favorite musical single, you waited until the weekend and listened to Casey Kasem countdown the top 100 hits until the "Ewok Celebration" song (AKA "yub nub" #60 on the top 100 chart). If you could have the presence of mind to stop doing the "Chief Chirpa" and hit record, you would have the soundtrack for your entire third grade year. This task was no different, if we waited long enough we knew we get some great stills from the promo. Check 'em out below. Not much is revealed in the 30-second spot, lots reactions to noises heard in the dark. But you definitely get the sense they traveled through multiple terrains in search of Bigfoot. They’re the largest funding platform for creative projects in the world. Every month, tens of thousands of amazing people pledge millions of dollars to projects from the worlds of music, film, art, technology, design, food, publishing and other creative fields. 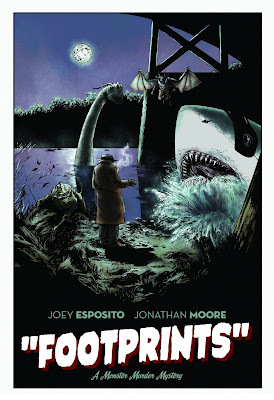 Footprints is a four issue mini-series by Joey Esposito and Jonathan Moore. 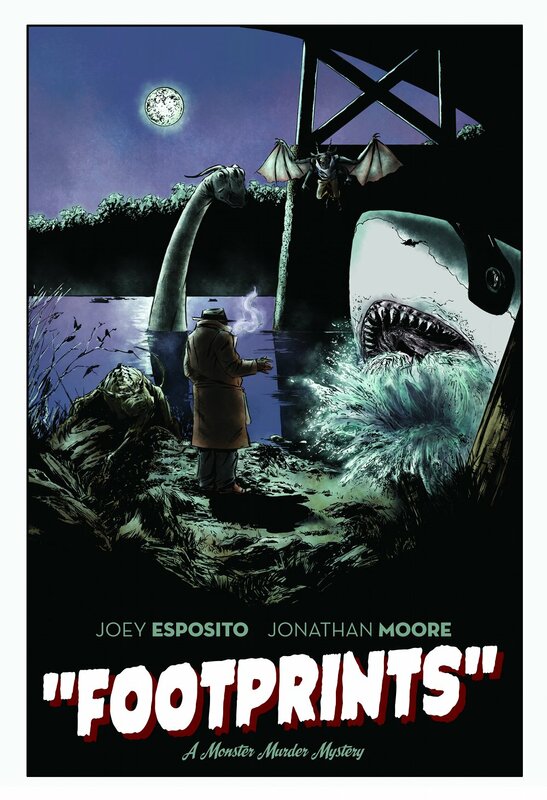 We’ve already completed (and printed) the first issue -- which you can read in its entirety here -- but now we need your help to finish the remaining issues as well as the collected trade paperback edition! Joey is a writer from New England displaced in Los Angeles, California, currently living with his totally awesome girlfriend, his cat, his dog, and a whole bunch of back problems. He's been reading comics since his Dad bought him an Adventures of Superman issue co-starring Gang Buster. Jonathan lives in South Carolina with his wife and two daughters, living on coffee and burning the candle at both ends to do what he loves -- both comics and fine art. Creator-owned comics are becoming harder and harder to support as the big two increase their market share, so make your voice heard by supporting fresh new voices! So where is your money going? We’ll use our Kickstarter funds to cover the page rates of our artists, and then to market and publish the rest of the series ourselves. The comics industry is a tough place for independent startups, so we’re counting on the unified power of the Internet to help bring Footprints through to completion! Don’t forget, you’re helping to fund three entire issues AND a trade paperback! And with any luck, let our dreams of making stuff up for a living come true. ** UPDATE: On July 11, 2013 Finding Bigfoot's Cliff Barackman referenced this post on Coast to Coast AM with George Noory. You can listen to the entire interview at the bottom of the post. Some feel the only way (or at least the best way) to prove Bigfoot is real, is a dead body. Many skeptics think so too, which leads to the often asked question, "Why hasn't anybody killed or shot Bigfoot?!" Lo and behold, Robert Lindsay with his same-named blog answers that very question. His finding? There have been at least 30 incidents totaling up top 32 shootings/killings in the last 125 years. For you long-time fans, you know we don't condone the shooting or killing of Bigfoot. We have covered those that claim they have proof of Bigfoot shootings. We have calso overed interviews of those that would kill Bigfoot. As for us? Although unlikely, we would prefer Bigfoot to let us swab his inner cheek with a Q-Tip and pluck a few rooted hairs--oh and a video would be nice. Below we have the condensed list of all 30 incidents followed by Robert's conclusion. 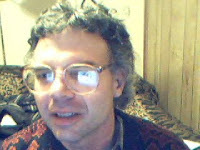 The list will give you a taste of what Robert has in store, as he has extended versions of all 30 incidents at his blog. 3. Unknown date, modern era: Yankton, Oregon. Near the Colombia River north of Portland, a hunter shot a Bigfoot four times between the eyes and killed it. 4. Unknown date, modern era, Amboy, Washington. Near Mt. St. Helens, a hunter reported that he shot and killed a male Bigfoot on an old logging road. 5. Unknown date: Sonora, Mexico. Rich Grumley reportedthat a hunter shot and killed a Bigfoot, then buried it. 6. 1856: Ohio or West Virginia. Possible Bigfoot skeletonfound with bullet holes in its skull. 8. 1900: Prince of Wales Island, Alaska. An Eskimo shot and buried a Bigfoot. 9. 1921: Terrebone, Louisiana. Hunters killed a Bigfoot and dumped the body in an old well. 11. 1928: South Bentnick Arm, near Bella Coola, British Colombia. On the coast of central British Colombia, George Talleo shot and killed a Bigfoot. 12. After 1937: Green River, Washington. In the Cascades east of Tacoma, a hunter saw a bear grubbing in a log and shot and killed it. Turned out he had killed a Bigfoot. 14. Fall 1941: Near Basket Lake, Manitoba. A 17 year old boy hunting out of season shot and killed a Bigfoot that he thought was a moose. 16. 1953: Alder Creek Canyon, Sandy, Oregon. East of Portland, a hunter shot and killed a Bigfoot, then buried the body. Reported by Peter Byrne. 17. 1958-1960: Overton County, Tennessee. Bigfoot stealing chickens was shot dead by the owner of the chickens. 19. 1965: Kitimat, British Colombia. On the coast of central British Colombia, a Kitimat man shot and killed a Bigfoot near town. 20. December 1967: Teton National Forest near Jackson Hole, Wyoming. Two college students from Marshalltown, Iowa, Lyle Bingaman and Mike Burton, shot and killed a Bigfoot, thinking it was a bear. 21. 1968: North of Carson, Wyoming. Three men were hired by a rancher to kill a Bigfoot that was killing his cows and sheep by tearing off their legs. 22. After 1968: Alabama. The same man involved in the Carson, Wyoming case above shot another Bigfoot later on. 23. 1969: Whiteface Reservoir, Minnesota. A hunter shot and killed a Bigfoot, then put the body on ice and displayed it for awhile before replacing it with a plastic replica. 24. After 1969: Clark, Washington. Neat Mt. St. Helens, a manshot and killed a Bigfoot, then tried to sell it, but stopped when he thought it might have been illegal to kill the Bigfoot. 25. 1970: Spokane, Washington. Grover Krantz reported that a hunter shot and killed a Bigfoot. 26. June 1976: Baltimore, Maryland. As unlikely as it sounds, a Bigfoot was reported here in May 1976. Police were called, and K-9′s initially refused to track it. 27. January 1976: Elm Creek, Texas Panhandle. Three menshot and killed two Bigfoots. 28. January 2000: Honobia, Oklahoma. The Siege of Honobia. Bigfoot apparently shot and killed as part of a group that was raiding and harassing a rural residence. 29. November 12, 2003: Lafollette, Tennessee. A creature had been killing peoples’ animals. A goat and cat at the very least had been killed. Local sherrif and deputies tracked Bigfoot and shot it dead. 30. August 2006: Slim Buttes, Pine Ridge Reservation, South Dakota. A Bigfoot that had been named Chiye-tanka was shot and killed on the reservation. "From 1884-present, a 125 year period, 32 Bigfoots have been shot dead by humans, hunters or otherwise. Humans kill or take into custody Bigfoots or their bodies once every 3.9 years or about once every 4 years. In most cases, after the Bigfoot was shot it was simply left in the woods where it fell. In some cases, it was buried. 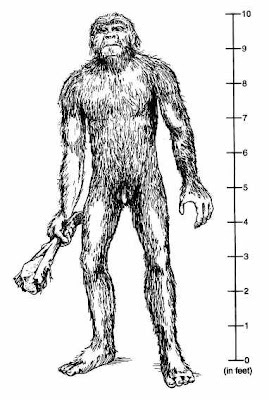 In the modern era, people who shot Bigfoots were often afraid to talk about it for fear of being prosecuted. They often thought that they had killed some sort of a human being and would be prosecuted for manslaughter or homicide. In recent years, government officials seem to be taking the bodies away after Bigfoots are shot dead. There is a possible government coverup occurring in recent years, since 1968. 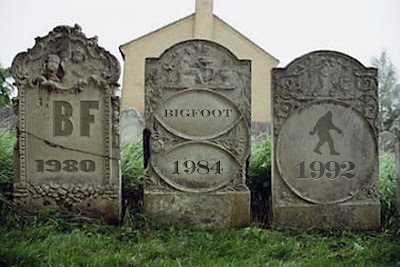 In the future, humans will continue to shoot and kill Bigfoots in North America. In order for science to make use of these bodies, the legal question regarding shooting a Bigfoot to death needs to be resolved somehow. Otherwise, people who shoot and kill Bigfoots will continue to abandon them or bury them in the woods. Bigfoot organizations should establish procedures about what to do the next time a Bigfoot is shot and killed. Probably the best plan would be to say that the organization is willing to accept and Bigfoot shot dead, no questions asked. The person could then donate the body to the organization without fear of being prosecuted. It’s doubtful that the government would go after the organization merely for holding a Bigfoot corpse. The organization should then contact a scientist such as Dr. Meldrum immediately, and probably arrange to have the corpse delivered to him. At the same time, notify the media. The government would have a hard time stealing the corpse away from Meldrum after the media have been notified. Anyone who shoots and kills a Bigfoot should try to protect the corpse and notify either Bigfoot organizations of prominent scientists such as Dr. Meldrum. Do not notify the authorities. If you do, you’re likely to never see the body again." You can read about every incindent at his site. At the post titled Why Has No Hunter Ever Shot and Killed a Bigfoot? To catch the part where Cliff references this post go to the 01:33:49 mark. Looking to end the 100-year old search for the mythical creature, Animal Planet is joining forces with Bigfoot researchers on a new series Finding Bigfoot. As highlighted in Animal Planet’s upfront presentation and airing on June 5 at 9 pm (ET/PT), the Ping Pong Productions six-part series follows a team of Bigfoot researchers in their cross-country expedition to locate the beast. The four-person team from the Bigfoot Field Researchers Organization (BFRO) goes to locations of alleged Sasquatch sightings to investigate with reconstructions and the latest technology to determine whether they were real or not. The BFRO team is made up of a former roadie, a science teacher, the BFRO president and a skeptical scientist. Animal Planet has set a premiere date for "Finding Bigfoot," its new hourlong skein devoted to hunting down the much-mythologized critter over the course of six episodes. The show will premiere Sunday, June 5 at 9 p.m.
Show follows a four-person team from the Bigfoot Field Researchers Organization, which exists, as they search for the Sasquatch in forests across the country where sightings have been reported: North Carolina, Georgia, Florida, Washington, Oregon, and Alaska. ANIMAL PLANET HUNTS FOR THE ELUSIVE SASQUATCH IN NEW SERIES, "FINDING BIGFOOT"
(Silver Spring, MD, May 4, 2011) - For hundreds of years, Americans in nearly every state have claimed they've spotted the mysterious and unexplainable creature known as Bigfoot, or Sasquatch. However, no one has proven that this pedaled creature - reportedly standing more than seven-feet tall and covered from head to toe in dark hair - actually exists. And as the myth grows, so does the passion for validating its existence once and for all! 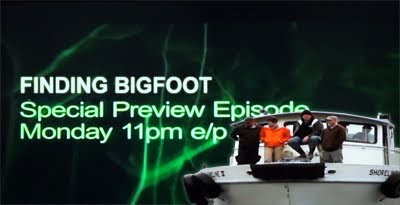 Beginning Sunday, June 5, at 10 PM (ET/PT), Animal Planet joins the quest with FINDING BIGFOOT. In each hour-long episode of the six-part series, cameras follow a team of Bigfoot researchers in a cross-country expedition to dissolve the myth and locate the elusive beast. A four-person team from the Bigfoot Field Researchers Organization (BFRO) - the leading scientific research organization exploring the Bigfoot/Sasquatch mystery - investigates supposed Sasquatch sightings by interviewing locals, examining evidence and infiltrating the woodlands and forests in places where Bigfoot has been reported, including Georgia, North Carolina, Florida, Washington, Oregon and Alaska. In each state, the team listens to harrowing tales of run-ins with Bigfoot before generating reconstructions of the encounters to judge their plausibility or dismiss them as hoaxes. Then, outfitted with the latest technology, including night-vision and infrared cameras, the team sets out on exhilarating and eerie investigations where any broken branch or peculiar noise could mean a Sasquatch is lurking nearby. 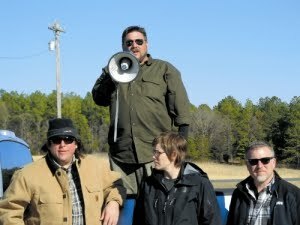 The BFRO Team is comprised of a former roadie (Bobo), a science teacher (Cliff), the BFRO president (Matt) and a skeptical scientist (Ranae); each teammate has varying experiences with Bigfoot and differing beliefs about the existence of this enigma. What binds them together, however, is their longing to understand the creature, passion for proving its existence and willingness to stop at nothing to finally track down Bigfoot. In the end, will they verify the presence of Bigfoot and convert skeptics, or will this obscure American legend elude them too? "The main mission of the BFRO is to resolve the mystery surrounding this great American phenomenon," says Matt Moneymaker, co-founder of BRFO. "I can't think of a better way to do that than by going on location and visiting each reported Sasquatch sighting."